All I Need is my first read from Jennifer Van Wyk, and it proved to be quite a revelation, especially in terms of just how good Van Wyk's writing is. The beginning of this story of hers sounded very familiar--bride ready to walk down the aisle discovers her groom cheating on her with--gasp!--her maid of honor and decides to walk out on the whole sordid affair. That's soon followed up with her meeting a man who will end up changing her world in more ways than one. 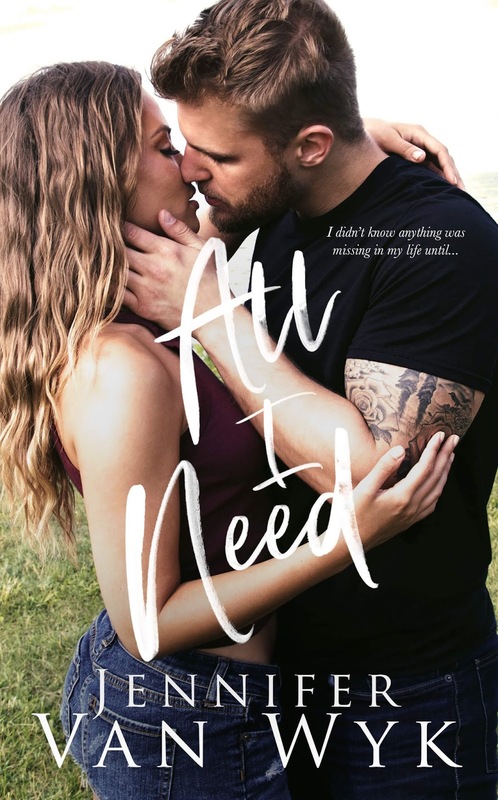 So yeah, I worried that this was going to be a run-of-the-mill runaway bride romance, but I stayed the course and kept reading, and I'm glad I did because the author put me in my place by giving me a love story that was both heartrending and heartwarming while also making sure that she added her own creative touch to it. It would be bad enough if you find out your husband-to-be cheating has cheated on you once, but twice? Well, let's just say that thirty-four-year-old Ellie Cummings has had that streak of bad luck touch her two times too many. What she needs is a place to just be because she certainly doesn't need to lay her heart down on the line yet again just to strike out. Having Walker McKinstry happen upon her just as she's about to beat the crap out of her ex's prized car proves to be a blessing. The thirty-five-year-old veterinarian recognizes her need for some peace and solace and takes her to their town of Liberty. From Miss Polly who provides her shelter to the rest of the townsfolk, Liberty is beginning to feel like home, and Walker is starting to feel like someone that Ellie never knew she needed. Learn more about Jennifer Van Wyk. Purchase All I Need on Amazon.